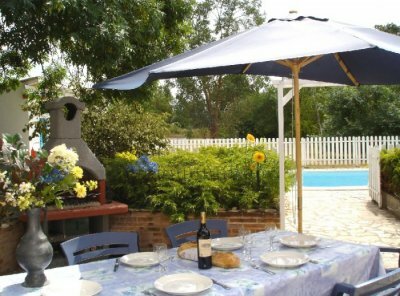 Description of Property: “Le Cottage Fleuri”, a very comfortable family home-from-home! - The open plan living room, with two large French windows leading onto the terrace, has a wood burner in the fireplace, SatTV/DVD, WIFI & very comfortable seating. - The kitchen is well-equipped with gas cooker, fridge/freezer, microwave, toaster, coffee machine and other useful electrical appliances. The kitchen has also a bar-counter and stools for easy eating. - There is a washing machine, tumble dryer, dishwasher, iron & board in the utility room. - The house sleeps from 2 to 5 in great comfort in three large individually decorated & furnished bedrooms. - The master double-bedded room; a twin-bedded room; and a third bedroom with large single beds. - The family bathroom has a bath with shower-over, twin wash basins & W.C.
- A second walk-in modern shower room on the ground floor has an additional basin & W.C.
- Some storage space is available in the garage. Outside Amenities: The South facing terrace is sheltered, totally private and surrounded by fragrant plants and trees. - There are tables, chairs & benches, a big parasol, a stone BBQ, just perfect for those alfresco meals sampling the local Gaillac wines ! - The terrace leads onto the private swimming pool and the pool house and beyond to a very large fenced garden with beautiful trees. - A fence around the pool is installed in order to make the pool completely secure. - There is ample poolside furniture around the pool which has a southerly aspect enjoying sunshine all day long ! - Interesting & colourful street-markets at nearby RABASTENS, LISLE/ TARN, and GAILLAC where some of the oldest wine producing vineyards are to be found. - Beautiful historic towns and medieval « bastides » walled villages are all around. CORDES is a gem of Gothic architecture on its « sugar loaf » 110m high. - Visit the 12th century cathedral of ALBI which is a UNESCO National Heritage Site and the birth town of the artist Toulouse Lautrec with a famous museum. - Also vibrant and very cosmopolitan pink-brick TOULOUSE (“La Ville Rose”), with its beautiful squares, fashionable pavement cafés, chic shops and many art galleries/museums. - For day trips the nearest MEDITERRANEAN beach is just under 2 hours, the PYRENEES are also only 2 hours away. This is a very brief taste of things to see & do around. Central heating (Thermostatic electric convector heating). Wood burning stove in fireplace. Price includes local taxes, water and utilities, Sat TV with English & French channels, high speed WIFI internet. Full linen provided. Rates apply to long term (minimum 6 months) stays only from October to end of May. Apply for special prices on shorter stays!